Although the Turkey Drop wasn’t held at the last Turkey Trot festival, we shouldn’t become complacent and assume that this cruel event is banned for good. Rather, we must remind the city’s mayor that this type of animal cruelty will not be tolerated ever again. For years, private planes flew over the Turkey Trot festival and threw turkeys out of the aircraft from a height of 1,000 feet. The birds plummet to the ground, unable to save themselves. They were fatally wounded when they finally made impact with the ground, bricks, buildings and cars among other objects. Aside from being unbelievably inhumane, the Turkey Drop is also illegal, as the annual event is in violation of state and federal law. The Federal Aviation Administration frowns upon this significantly. 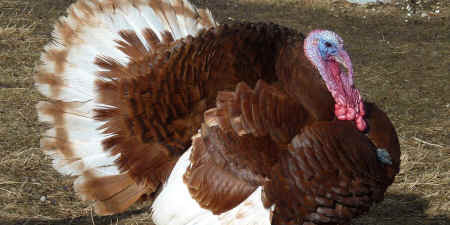 IIt is time once again to remind the mayor of Yellville, Arkansas that the Turkey Drop once held at its annual Turkey Trot festival remains unacceptable. This unthinkable annual tradition is a display of animal cruelty at its worst. PETA and its supporters have stood firm against Yellville’s annual Turkey Drop, and as the city prepares for this year’s festivities, let’s remind them that we remain resolute in our fight against this. Although the Turkey Drop wasn’t held at the last Turkey Trot festival, we shouldn’t become complacent and assume that this cruel event is banned for good. Rather, we must remind the city’s mayor that this type of animal cruelty will not be tolerated ever again. Let’s continue to prevent Yellville, Arkansas’ annual Turkey Drop.